Covering the anatomy, physiology, and pathology of the nervous system, Veterinary Neuroanatomy and Clinical Neurology, 4th Edition helps you diagnose the location of neurologic lesions in small animals, horses, and food animals. Practical guidelines explain how to perform neurologic examinations, interpret examination results, and formulate effective treatment plans. Descriptions of neurologic disorders are accompanied by illustrations, radiographs, and clinical case examples with corresponding online video clips depicting the actual patient described in the text. 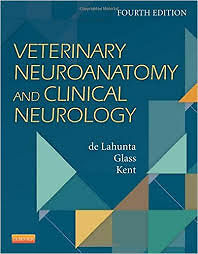 Written by veterinary neuroanatomy and clinical neurology experts Alexander de Lahunta, Eric Glass, and Marc Kent, this resource is an essential tool in the diagnosis and treatment of neurologic disorders in the clinical setting. - Disease content is presented as case descriptions, allowing you to learn in a manner that is similar to the challenge of diagnosing and treating neurologic disorders in the clinical setting: 1) Description of the neurologic disorder, 2) Neuroanatomic diagnosis and how it was determined, the differential diagnosis, and any ancillary data, and 3) Course of the disease, the final clinical or necropsy diagnosis, and a brief discussion of the syndrome. - Over 250 high-quality radiographs and over 800 vibrant color photographs and line drawings depict anatomy, physiology, and pathology (including gross and microscopic lesions), and enhance your ability to diagnose challenging neurologic cases. - A companion website hosted by Cornell University College of Veterinary Medicine features more than 380 videos that bring concepts to life and clearly demonstrate the neurologic disorders and examination techniques described in case examples throughout the text. - High-quality, state-of-the-art MR images correlate with stained transverse sections of the brain, showing minute detail that the naked eye cannot see.